This story was probably designed to make the reader feel good and have “hope”. And kudos the that guy for doing and enabling some really good and clever stuff. Reality check. On very few occasions, have lent my professional (and crackpot) skills for the ‘greater good’; whatever that is. But have more oft than not have sold my soul to the highest malevolent bidder. There is very little rationale for “hope”. There is very little rationale to attempt to make others share in your own personal misery. I don’t even understand the rationale behind this comment. Like, what are you trying to say? It’s good to see this being done, not only for the sake of the young lady with the disability, but also for any other photographers with limited/no use of their hands. As someone who is slowly losing proper hand control due to progressive nerve damage, this is something that I will keep in mind for the future, should I need it. Nice to see something like this, maybe he could, in the next iteration, add degrees to the movement command, i.e. “right 20 degrees”, etc. Now all we need is for somebody to hack that girls spine back into working shape. In a crowded setting, or outside in the wind, or an area with echo’s, voice command will fail because of the extra distortion. A throat microphone will solve that problem. >Unfortunately a mishap in 2005 ended her career as an aerialist when she severed her spinal cord, leaving her paralyzed from the shoulders down. There are commercially available HD video cameras that can be tripod mounted and track multiple ‘targets’ via WiFi transmitters. A remote can change which emitter is tracked. Not voice activated, but set and forget. Don’t recall brand name. There’s a few out there but this one seemed to win on price and performance. It is a good start, but pretty basic. An IMU mounted on glasses/hair clip/etc. on her head for positioning, a throat/bone conduction mic, and CHDK/Magic Lantern on the camera would let her do pretty much anything she wanted with her camera. She could even have a dolly track + lift on the front of her chair for a lot more options when it comes to angles. 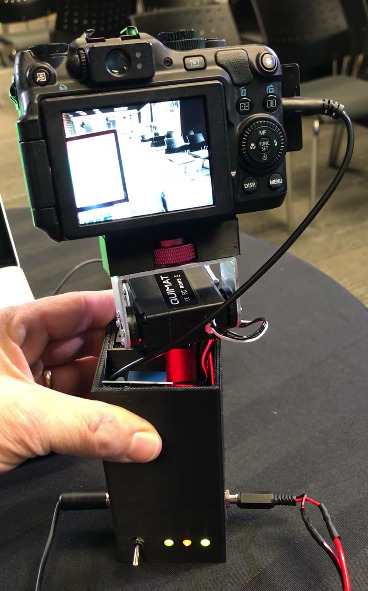 This was built using an Arduino and Easy VR3. If you know how or can help to make this better, please contact me. Angles are fine for now, need help with controlling zoom of camera and possible noise issues with microphone. I’d have to read into the camera hardware, firmware and software capabilities before commenting on the controlling of the zoom in exact detail. My guess is worst case scenario if there is auto-focus… then leads can be micro-soldered to the zoom switch to control with a micro-controller. A mechanical option would be integrating a mechanism to the zoom switch. A more cumbersome way without autofocus would be a lever or pulleys on the lens and then a shaft going back to a servo. I’m thinking there is a better way via software… though I am not sure. The more mechanical approaches might require some sort of specialize frame around the camera or maybe just using the threads on the lenses themselves to create the mount points. I was thinking about doing that with the Minolta non-autofocus lenses I have for the C920 SLR project I am working on. Basically, just create a male and female threaded section on the plate with a hole for the shaft of the servo that rotates with a pulley and belt on the lens focus. There might even be enough threads on lens filters or adapters to fit a plate if thin and rigid enough at that mount section. The zoom slide will be more challenging and I didn’t get that far in brainstorming.